Sterile surgical S/Steel Chinese style needles w/spiral wound silver plated copper handle. with a spiral wound silver plated copper handle. with spiral wound gold plated copper handle. 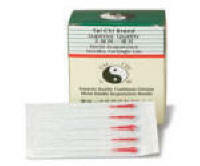 One needle with one insertion tube per individual blister pack. Box of 100 needles.